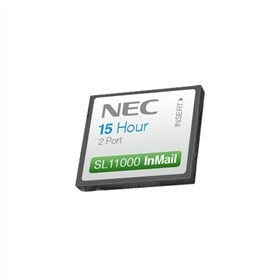 The NEC 1100112 is an InMail Voicemail Card specifically designed for the NEC SL1100. InMail is available as a 2 port/15 hour storage up to a larger 2 port 15 hour system. The InMail provides Automated Attendant and voice mail functions and is expandable to a maximum of 16 InMail ports with optional 2-port licenses. This 1100112 installs in the Voice Mail Daughter Board which is part of the main KSU and its maximum duration per message is 2 minutes. It also provides 84 Subscriber Mailboxes, 16 Routing Mailboxes, and 16 Group Mailboxes. The NEC 1100112 has many exciting features for users of all types. The NEC 1100112 is sold as a Brand New Unopened Item.